Harrold de Raad, who marched soprano with the Crossmen in 1999 and 2001 (and with Johan Friso from 1987 to 1996), submitted this one. 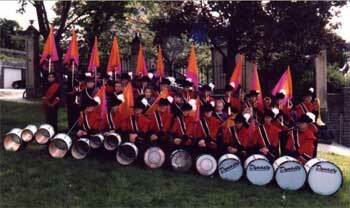 "This is the Johan Friso junior corps from Middelburg, the Netherlands. They are the feeder corps of Juliana. This is a picture after a show they played in May of 2003. "Johan Friso won the Dutch championships 11 times! The kids are between the ages of 6 and 16." Thanks Harrold! E-mail your Forzato submissions -- and we will get to them all, in time -- to dave@dci.org along with where and when the photo was taken. Send some biographical information about yourself as well. We'll give you full credit. Also, let us know if you want your e-mail address included, to get feedback from other drum corps fans.